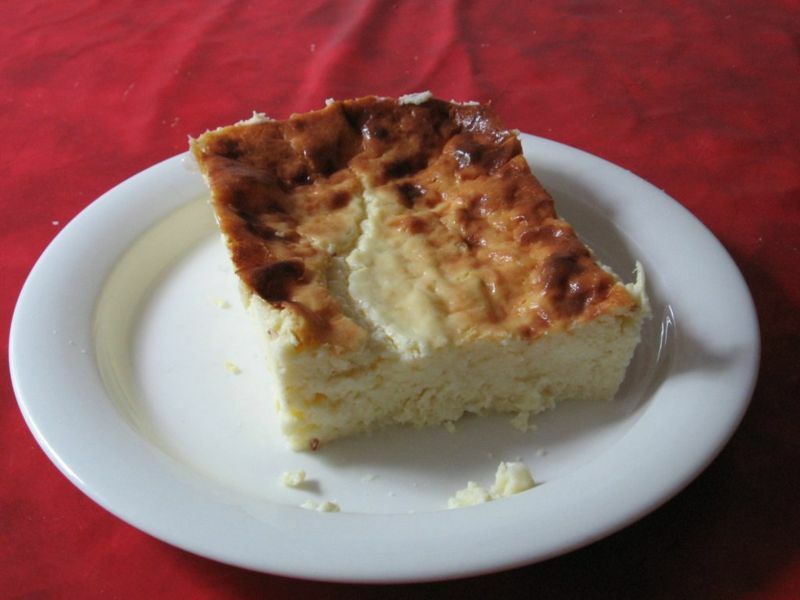 Ostkaka, ("ost" meaning "cheese" and "kaka" meaning "cake" in Swedish) also known as Swedish cheesecake or Swedish curd cake, is a Swedish dessert that has its roots in two different parts of Sweden, Hälsingland and Småland. The dish is usually eaten warm or lukewarm with different jams and whipped cream, or with fruits or ice cream, and has a gentle taste of bitter almond. Ostkaka is traditionally produced by adding rennet to milk and letting the casein coagulate. Cream, sugar, eggs, almonds and bitter almonds are added to create a batter. It is then baked in an oven and served warm - never hot, as this will nullify the rather delicate flavour. Traditionally the Småland variety is cooked in a large copper pot. This gives rise to a tradition of allowing guests to take their portions from the centre of the Ostkaka, thereby avoiding any traces of copper that may have leaked into the mixture where it is in contact with the pot. Since the process of curding milk is somewhat complicated, alternative recipes intended for home cooking instead use cottage cheese as a base to simulate the texture of the dessert.